With offshore pretty much written off by most, inshore action was the game over the last week. In Jensen Beach and in Jupiter snook fishing was the call. In Jensen, using the east side of the river or bridge pilings as cover from the wind, anglers were having excellent luck using D.O.A. terroreyez lures. Also, along the bridges the fishing for drum and sheepshead was good flipping shrimp. 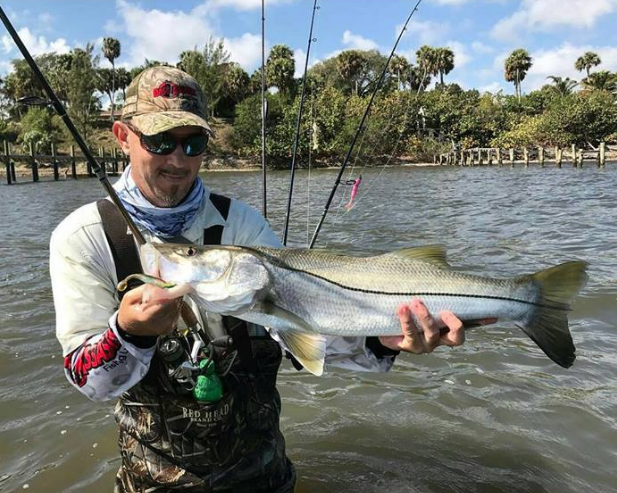 In Jupiter, in the Intracoastal and the Loxahatchee River, the snook were hitting lures as well as shrimp and mullet. Good fishing for jacks and small tarpon was also reported in the Loxahatchee River. In the Boynton Beach area, blacktip and small hammerhead sharks have been hanging around the flats and deep channels in the Intracoastal between the Ocean Ave. bridge and channel marker 42 off Hypoluxo Island. Fishing for pompano and croakers has been good around the Lantana bridge with anglers using cut shrimp, sand fleas and white pompano jigs tipped with shrimp. Despite the hard east winds, the fishing has been OK on the lake, however, the water is dirty from being churned up. Live bait is the key.